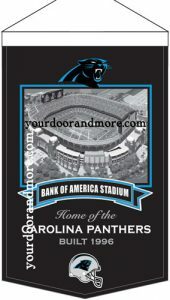 While living in North Carolina, my banner manufacturer has not had a huge demand for any stadiums in NC. Most shows I have been a vendor, that is the first thing I am asked. Do you have the Panthers, they are an NHL team. I have persisted and they agreed to pursue the reproduction license.